Middlesbrough FC is a football club with a very long history. They reached the final in the FA Cup 1997 and won the Football League Cup in 2004. Among the latest achievements for the club was to reach the UEFA Cup final in 2005-2006, which ended with a loss against Sevilla. Among the most prominent player George Camsell, George Hardwick, Wild Mannion, Nick Barmby and Fabrizio Ravanelli could be mentioned. 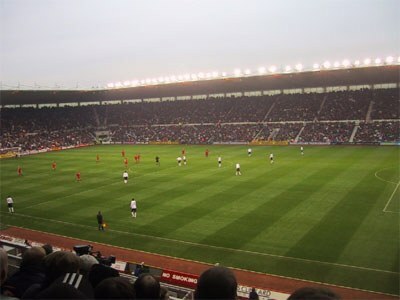 Middlesbrough vs Liverpool at Riverside Stadium in 2003. The club was founded in 1876 by Middlesbrough Amateur Cricket Club and become a member of Football league 1899. Middlesbrough entered the FA Cup for the first time for the 1883-84 season. They played in Division One for the first time in 1902 and their best position is a third place in that division, which happened in 1914. In 1986 the club had a bankruptcy. After that a shift of ownership took place and the club was reconstructed. They had to start in division 3, but would climb up and played in the Premier League season 1996-97.